Rosie specialises in commercial litigation, including complex disputes involving commercial transactions, shareholder rights and construction disputes. Rosie is also qualified as a Solicitor Advocate with Higher Rights of Audience. She has a particular interest in the protection of intellectual property rights and works closely with companies that focus on technology and R&D when they are involved in licensing, patent and design right disputes. Rosie also has significant experience in working with companies in the FMCG sector to develop marketing strategies that balance commercial drivers with the need to protect trade marks and brand identity. Rosie enjoys working closely with clients to find a commercial resolution to their problems, without necessarily resorting to costly and time consuming litigation before the Courts. Rosie has a MA(Oxon) in Biological Sciences from Oxford University. She subsequently converted to law and spent over 10 years in the disputes team at Herbert Smith Freehills in London, where she focused on disputes in the life sciences sector. 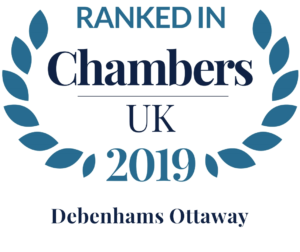 She joined Debenhams Ottaway as a Senior Associate in 2017. As well as advising extensively on disputes under UK law, she has also been closely involved in litigation across Europe and before the Court of Justice of the European Union.